● In 1991 after completing years of extensive research and rigorous academic requirements, she became the first Mexican woman to earn the prestigious Doctor of Clinical Hypnotherapy Degree from the renowned "American Institute of Hypnotherapy" The only educational body in the country to offer such prestigious title. She held the position of Resource Center Director for the American Institute of Hypnotherapy for 13 years. ● In 2011 she updated her skills and training to re-certify her credentials as an NLP Trainer and other modalities such as EFT and Life Coach with Master Trainer Michael Stevenson at Transform Destiny. ● Dr. Leticia has developed two programs: “Inner Dimension Therapy” ™ an effective and empowering set of therapeutic tools for changing the chain of events in the client’s lifetime that lead to an array of unwanted emotional states or behaviors. It’s an excellent form of Brief Therapy, since negative emotions, unwanted beliefs and limiting decisions are eliminated, empowering the client with a sense of release, freedom, and positive energy. ● And as a cancer survivor since 2002 developed “From Discovery to Recovery”™ a unique program designed to assist cancer patients in their process of going through tests, surgery, recovery clicking the instruction, and recovery in a more relaxed and confident way. Offering them assurance, strength and professional assistance while they undergo the process of restructuring and gaining control over their lives, recovering health, improving self-image, and becoming empowered. ● Ever seeking to her commitment to spiritual healing and growth, Leticia has developed and produced her own audio Spanish CD series on health improvement and maintenance; a double CD album entitled ● “Sendero a la Salud” “Path to Health”. She is currently developing and producing more audio programs both in English and Spanish and is constantly researching new applications and modalities, as well as developing workshops and seminars. ● Her constant motivation has led her to study Tantra, Nutrition, Aromatherapy, Chromo-therapy, Shamanism, Crystals, Dermal-Optical-Perception, Kirlian photography, and many other modalities including Visual Arts and Martial Arts. As a result, she has dedicated her life to share her expertise and abilities to transform other people's lives through her developed intuition and the Guidance and Spirituality she is so intimately connected to. Her compassionate heart and love for nature have allowed her to perform distant and in-person energy healing on animals and trees alike. ● Certified Spiritual Counselor, from the prestigious American Board Of Hypnotherapy, again being the first Mexican woman to earn such certifications in this country. Leticia is also a ● Reiki Master, graduated from the Inner Quest Awareness Center in 1999, and she is second level in Karuna Reiki. Additionally, she has taken the level I from “Vybrakyton Reiki” which brings Reiki into the new millennium. Her intention is to become a Master teacher in this powerful and innovative healing technique. Leticia has trained extensively in Past Life Regression, Time Line Therapy, Applied Kinesiology, Science of Mind I & II, Iridology and Hypnoanesthesiology. ● Dr. Leticia was the host of her own Radio show called "Los Secretos De La Mente" broadcasted through "Radio Labio in Hollywood, Ca. from 1994 - 1996. ● In conjunction with Dr. George Bridges, Leticia has developed a program called: ● Therapeutic Intervention Recovery Program — T.R.I.P. TM designed to assist our youth and those suffering from violent traumatic experiences such as abduction, war, torture, and sexual abuse. Including individuals who are prosecuted and live in fear and confusion because of their sexual orientation. 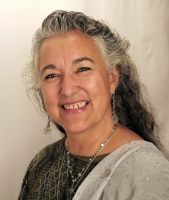 Dr. Leticia fervently supports the Native earth religions and practices. Developing a Certified Shamanic Practitioner Training has been her desire for a long time. She teaches a Basic course several times throughout the year. ● While still a teenager, she attended a seminar on "The Silva Mind Control" which led to her discovery of her vast potential in the use of energy and mind. She has also dedicated herself to the study and application of her favorite, holiest and most revered beliefs: Earth Religions and Women’s Spirituality. She has utilized this knowledge to develop her abilities, which she successfully applies in the vast field of her profession. ● Dr. Leticia also participated in classes and events at the “Common Ground Spiritual Center” in Corona, CA; And other Spiritual centers in Lake Forest, CA, She is involved as a facilitator and therapist at the School Of Multidimensional Arts And Sciences (www.smhas.com) in Irvine, CA, and was involved in founding the "Project Earth Core" organization and has participated in other important projects as consultant, designer, producer, and translator for several of her colleagues, in their publishing, training, concerts, promotions, marketing, and audio and video productions. Besides maintaining her bilingual private practice, she dedicates time to paint, and hikes as often as she can in her forest devoting time to meditating among her beloved trees and wildlife. Check out her paintings by clicking on this link button. Dr. Leticia loves color, comfort, and beauty. She has designed her own and unique line of clothing which she will launch very soon. (www.flowdess.com) Check back often. A.M. Krasner Ph.D. (1928-2013) was the founder and director of the American Institute of Hypnotherapy (AIH) in Irvine, California. An innovator in hypnotherapy in the US, Dr. Krasner practiced in Rhode Island for over 20 years before moving to Southern California in the late 1970s where he continued developing his methods. In 1980, he founded the American Institute of Hypnotherapy (AIH) to teach clinical hypnotherapy to others. The DCH program was developed to train practitioners who would keep up with research but might choose not to engage in research themselves. The American practice of recognizing specialist institutions for specialty disciplines allowed the AIH to offer these facilities for practical training and off-campus study. In 1982 Dr. Krasner founded The California Board of Hypnotherapy. Within a short time, it grew to be the renowned American Board of Hypnotherapy. The A B H held a yearly Convention in So California for over 15 years providing high-quality hands-on certification training to the AIH Doctorate students and its worldwide members. Until 2007, the BPPVE was the state agency vested with the authority to approve and regulate private postsecondary institutions in California and was charged by the California legislature with the mandate to encourage the development of strong, vigorous and widely respected sector of private postsecondary education. State 'approval to operate' meant that the BPPVE had determined that at the time the institution was reviewed, it met standards established by the bureau for integrity, financial stability and educational quality. In order to obtain a doctorate, students had to have attained a Bachelor Degree level of education. AIH offered an opportunity to study diverse applications in hypnosis via a wide range of hypnotherapeutic educational modules including the fields of healthcare, psychotherapy, self-development, and business. The California State Legislature has determined that state licensing may not be conferred upon an occupational group for purposes of status or prestige. Hypnotherapists are not issued licenses by any State Governmental Agency to engage in their professional services. The American Institute of Hypnotherapy (AIH) was a State approved educational establishment under the jurisdiction of the Bureau for Private Postsecondary Vocational Education (BPPVE). (School no. 3004761) A Degree-granting authority at that time came from the Office of the Superintendent of Public Instruction under the provisions of Section 94310.3 of the Education Code of the State of California.